Starbucks Coffee Company is the largest coffee company in the world with over 17,000 stores in 49 countries, the majority of which are in the United States. The Starbucks Coffee Company is building a presence in even more countries worldwide. And it develops its coffee drinks sales from a variety of stores in both location and size, from small outlets to large scale premises in prestige locations, all selling a variety of Starbucks coffee beans , to go and for home brewing. On their menus you will find a variety of coffee drinks (such as cappuccino,latte, mocha, etc), teas and fruit juices, as well as their own brand of coffee beans , and a range of other products, too. 2011 saw the relaunch of the Starbucks logo with the words ‘Starbucks Coffee’ removed entirely from the logo. Howard Schulz has big plans to turn Starbucks Coffee company into a premium brand retailer of not just coffee. 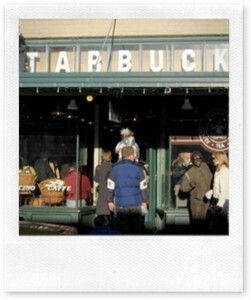 Begun as a small coffee bean roaster and retailer in 1971 as a joint venture between two teachers and a writer, Starbucks Coffee Company first store remains open to this day at 1912 Pike Place, and the name is still used on special edition coffee roasts. This early start is still commemorated in their Pike Place Roast. It was during these early days that the company fomented their roasting skills as they specialized in roasting quality beans that were purchased from growers, and selling them to the retail market. Initially, the partners were against selling any drinks in the store; and Howard Schultz who had joined the company in 1982 realized that there was a much larger market in selling prepared drinks. Instead they concentrated on expanding the retail sales by buying their first supplier, Peet’s; but Schultz started the coffee bar chain called Il Giornale in 1986. You can still see the original notion in most Starbucks stores today, as retail merchandise from coffee beans to mugs to coffee makers are all available. In 1987, Starbucks Coffee Company was sold to Schultz and all the Il Giornalecoffee shops were rebranded as Starbucks, and the modern incarnation was born. By 1992, and its IPO on the stock market, Starbucks had grown to nearly 200 stores. Starbucks Coffee Company soon opened stores throughout the area and quickly began to expand across the country and then the world which began in 1996 in Japan. Further takeovers were also carried out, including one of my favorite stores: Seattle Coffee Company, Seattle’s Best Coffee, Diedrich Coffee, Coffee People, and several others. The stock also caught investors’ attention, and (at adjusted prices) went from less than $1 a share in 1993 to almost $40.00 in 2006. A huge increase that would have rewarded those insightful investors handsomely in just 13 years! Starbucks Coffee Company stores are a part of the morning routine of millions of commuters, who can’t imagine not getting their breakfast pastry or a cup of coffee made to their specific order every day. The cafes strive to maintain a casual but orderly atmosphere and offer a variety of drip coffee, espresso and other hot and cold drinks, high quality coffee beans, snacks and sandwiches, salads, coffee mugs and other merchandise. Starbucks employees who wear black aprons with “Coffee Master” printed on them have attended the company’s Coffee Master course. You can ask these employees nearly anything about growing regions, roasting methods, purchasing practices and other coffee subjects and get a knowledgeable answer. They can tell after a brief conversation with you what kind of coffee beans would appeal to your tastes and from what region the beans will come from! 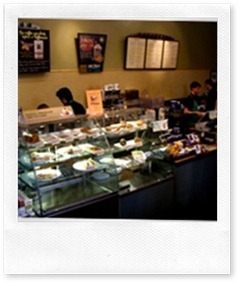 To read more about Starbucks coffee, click on the article here: Starbucks Coffee. Or check out some of the actual popular Starbucks coffee products below. Or continue reading below. The Starbucks Coffee Company has had a fair-trade policy for some time; they buy only organically grown coffee from family farmers who used earth friendly farming practices and natural pest control. In 2000 they introduced their own line of fair trade products and are now the largest buyer of Certified Fair Trade coffee on the North American continent, which is ten percent of the global market. Starbucks Coffee Company also devotes a lot of effort to charitable causes, mainly child-based. When you visit one of their stores, you will probably notice a collection box for one of their various children’s charities from around the world. Since 2007, though, the company has faced some tremendous challenges in the market place, with the economics, with over-paced expansion, and in the stock market as the initial romance faded. Starbucks has always tried to maintain its price-point, and in the early days hiked prices on baked goods several times; but with only a minimal improvement in product quality. Their range is much better than it used to be, but competitors abound and they tend to stock more delicious cakes, breads, sandwiches, and much more. Whereas, it’s not unusual to go into a Starbucks in the late afternoon or early evening and find not much left on the shelves to eat. The managers seem SO scared of ordering too much food, and some of it going to waste that they’d rather not take the risk of not selling it out. They, of course, leave a lot of extra money on the table; and customers’ bellies are empty, too! Starbucks has a large number of negatives in my mind these days: the trouble over their attempt at increasing the size of the drinks really annoyed many regulars – a medium cup was no longer 12fl.oz but 16oz because the large size was now 20oz. Many customers were offended by this practice, and in our local market, the company relented. Starbucks core coffee quality has also suffered, in a number of obvious ways. First, coffee flavor is no longer ubiquitous; there are two types of coffee machines in use now – the traditional espresso machines that require a real barista’s skill and the automated machines that vend coffee like a typical vending machine. The flavor of the coffee produced is different in character, strength and color between these two types of machines. I have had terrible coffee produced by these machines on more than one occasion; and I always complain by sending it back. Even adding an extra shot doesn’t quite reach the quality of the original espresso machines! They also cut a number of their services (including free water, and some stores no longer put out milk or cream for coffee in many markets); they make little effort at recycling by encouraging even sit-in customers to use paper cups, disposable plates and cutlery when all of these simply shout premium cheapskate. Another real complaint from all of the stores I’ve been: why do we have to pay for Wifi in the store in many markets? Many of the competitors provide free wi-fi all the time; and many customers with mobile broadband are reluctant to pay twice, if they can’t access their own service. And in the other corner? So, naturally, competitors arose in many markets; some of them were natural competitors who were slow to adapt to the new phenomenon, others simply didn’t market skills and products that they already had, say Dunkin Donuts. But in the past five years, competitors in many markets have appeared; I am a big fan of Barista Coffee in Taiwan which makes one of the best cappuccinos I’ve ever had; 85C which has great cakes and Americano coffee, and is now expanding in many Asian markets; of course, you can also buy coffee at Dunkin Donuts (which is strong, succulent, and delicious). Australia represents one market where Starbucks Coffee Company actually had to withdraw by closing down most of its stores, because Australia was such a competitive market already. Italian and Greek immigrants really drove the initial development but the coffee craze began in 1980’s, just as in Seattle; and Starbucks never really managed to adapt their products to the more European tastes. Even in the UK, many coffee shops draw on the European traditions of darker, stronger and less sweet coffee drinks. Even McDonalds is making great coffee these days. So I wonder: What will Starbucks Coffee Company have to do to regain customer’s undying devotion? While Starbucks Via, and some of the other Starbucks product developments are helping to retain eyeballs; I don’t think many investors really believe that selling instant coffee will really turn things around! Education in how not to run a global giant! But their biggest challenge has been their insistence on selling only one brand of their own house coffee on their stands. They were the first real coffee chain that went global, and they educated their clientele to buy good coffee rather than the Nestle instant coffee we’ve all been drinking since soluble records began. At some point, though, their education stopped; and they ramped up the marketing instead. Many customers now have little or no idea what goes into their morning brew, as the company seems to turn out more and more variations of coffee that get further and further from the company’s roots. Expansion is continuing in emerging markets, especially China and South East Asia; but challenges abound for this global giant. There are so many ways a good coffee shop chain could run rings around Starbucks Coffee Company, that I wonder how the owners and managers sleep soundly at night. Starbucks Coffee Company has opened the Pandora’s box for coffee, and for the longest time was the unofficial representative of good coffee in many countries; but nimble competitors are finding gaping holes in the market and serving them gladly. Starbucks, wake up! Smell the Starbucks coffee beans ! There are many eager and strong competitors in every coffee niche here – each of which is itching to take a large part (or all?) of your business. And I, for one, believe we’ll all be better for it, too!